Today I read a sad story about a man who was attacked and killed by a grizzly bear while trying to photograph it in Denali National Park (Alaska). 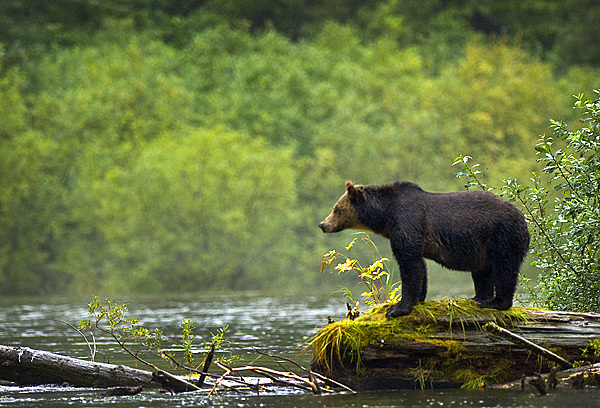 Apparently, he was photographing it for over eight minutes, and got within 50 yards of the bear. The bear probably then felt threatened, and attacked the man. Whenever you see wildlife, it’s always exciting. And, especially as photographers, I think we get even more excited than the average person, and totally forget about safety sometimes in the pursuit of a photograph. Note from Steve: Today Iʼm happy to publish our first guest post here at PhotoNaturalist. This post was written by Robert Berdan, of Calgary, Alberta, Canada. Robert has a lot of experience with photographing mammals (something I pretty much have NO experience with! ), so I was pleased to accept his post about photographing grizzly bears. After you finish reading, be sure to check out his great website for more articles and photos! And, if youʼre also interested in writing a guest post, please feel free to contact me. Thanks! 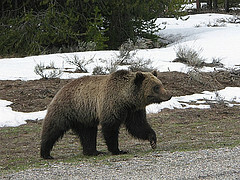 I will never forget the first time I encountered a Grizzly bear on the trail. I was walking with my friend Frank toward Siffleur Falls on the North Saskatchewan river just west of Banff National Park, Alberta, Canada.